“Moving day is a blast!” said no one ever. If your dog could talk, he’d be with you on this! As you work hard to have all your ducks in a row for the big day, keep in mind that your dog doesn’t have a clue what’s going on. The move can be traumatic for your furry friend or it can actually be okay. With careful planning, you and Fido can both arrive at your new home feeling as stress-free as possible. Make sure you’re up to date on your dog’s vaccinations, as well as heartworm, flea, and tick prevention. Parvo and parasitic worms can live in yard soil for up to a year. 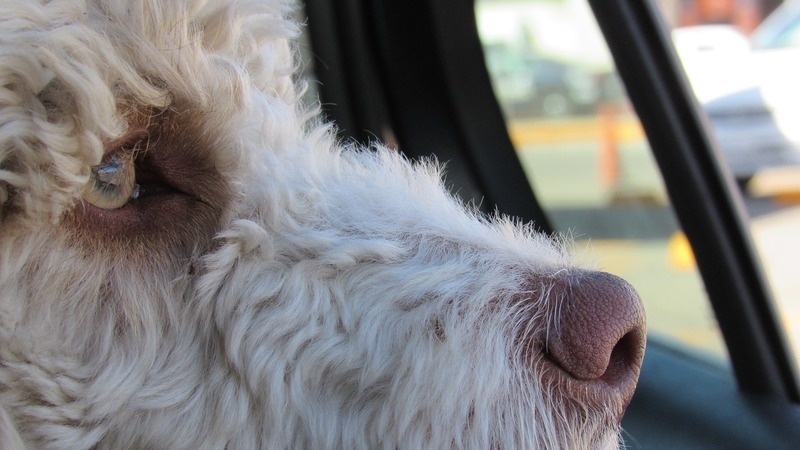 If your pet is prone to car sickness, make sure to get any prescribed medications from your veterinarian. You might also ask your vet about any calming medication, but be sure to try it out ahead of time. Check your new yard for plants that are poisonous to dogs, and while packing and unpacking, watch for any potentially dangerous items like chocolate or cleaning supplies your dog might have access to. Start a checklist to help you keep everything organized. The more you can prepare, the better off you and your dog will be when it’s time to make the big move. Make sure your dog’s collar has an ID tag with your name and phone number. Microchipping is also recommended. If possible, take your dog to visit the new house before moving day. Taking him for a walk in his new neighborhood will help him feel more comfortable when you move and will reduce the chances of him running away or getting lost. Consider hiring dog-friendly movers. This can be a huge stress reliever. Remember: A calm you equals a calm dog. When your movers arrive, give them treats so they can greet your dog with a friendly hello. Be sure to alert them to anything they need to know about your dog, especially if he is aggressive. Some moving companies have policies about dogs being on the premises during moving day, so be sure to check with them prior to the big day. Confine your dog to a quiet, secure room such as your bathroom. Hang a sign on the door to alert others not to open it. If crate-trained, place him in his crate for the bulk of the day. Make sure he still gets plenty of water and walks. A tired dog is a happy dog! Send him to doggie day care, a kennel, or a friend’s house. Keep all of your dog’s items (bed, toys, bowls, etc.) with you in your car. Unpack them as soon as you arrive and put them in the same places they were in the old house; if he’s accustomed to finding his water bowl in the kitchen, that’s where it should go in the new kitchen. As much as you may want everything entering your new home to be squeaky clean, hold off washing his bowls to toys. Those familiar scents will help him feel more at home. And because dogs are creatures of habit, stick to his previous feeding and walking schedules to avoid too much upheaval. If you have a fenced yard, check every inch of the perimeter to ensure your dog can’t get out and that other animals can’t get in. Unless you’re with him, keep him inside until he has settled in comfortably. If you’re unable to stay home the first few days following a move, consider arranging for someone to visit your dog each day to ease his anxiety and to burn some energy. Incorporating these tips into your overall plan will help your move go more smoothly. By prepping for your dog, staying organized, hiring movers, and letting your pup get acclimated to his new surroundings, you’ll be unpacking and enjoying your new home in no time.